Supports fundamental research focused in the natural sciences—in areas of direct relevance to DOE missions within chemical, condensed matter, materials, and geological sciences. Advances environmental and biomedical knowledge that promotes national security through improved energy production, development, and use; international scientific leadership that underpins the nation’s technological advances; and research that improves the quality of life for all Americans. The national basic research effort in advanced plasma science, fusion science, and fusion technology—the knowledge base needed for an economically and environmentally attractive fusion energy source. Supports world-class, high-performance computing and networking infrastructures as well as supporting fundamental research in mathematical and computational sciences to enable researchers in DOE scientific disciplines to analyze and predict complex phenomena for scientific discovery. ARPA-E is an innovative and collaborative government agency that brings together America’s best and brightest scientists, engineers, and entrepreneurs. The focus of Sandia’s ARPA-E program is to establish partnerships with universities, industry and other National Labs to create innovative energy solutions for the Nation through both maturation of industry capabilities and commercialization of our technologies. Jon Ihlefeld, a Distinguished Member of the Technical Staff at Sandia National Laboratories, has been selected to receive the 2017 Richard M. Fulrath Award from The American Ceramics Society. 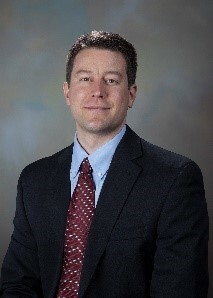 Jon was selected by unanimous decision for his contributions to electronic ceramics research and development. This award recognizes individuals under the age of 45 that have demonstrated excellence in research and development in the ceramics sciences. Presented to 2 American researchers and 3 Japanese researchers annually since 1978, this award promotes technical collaboration among the diverse cultures surrounding the Pacific Rim. Dr. Ihlefeld is internationally recognized for his work on ferroelectrics, funded, in-part, by the Laboratory Directed Research Development Office at Sandia, dielectric integration, funded, in-part, by the Office of Electricity’s Energy Storage Program managed by Dr. Imre Gyuk, and fast ion conductors, funded, in-part, by the Office of Nuclear Energy. The award will be presented at the 119th annual meeting of The American Ceramics Society, in Pittsburg PA, October 9th, 2017. 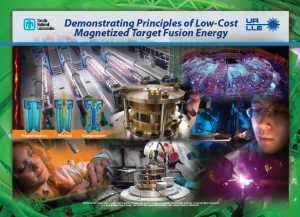 Sandia National Laboratories is partnering with the Laboratory for Laser Energetics at the University of Rochester to investigate the behavior of the magnetized plasma under fusion conditions, using a fusion concept known as Magnetized Liner Inertial Fusion (MagLIF). MagLIF uses lasers to pre-heat a magnetically insulated plasma in a metal liner and then compresses the liner to achieve fusion. The research team will conduct experiments at Sandia’s large Z facility as well as Rochester’s OMEGA facilities, and will collect key measurements of magnetized plasma fuel including temperature, density, and magnetic field over time. The results will help researchers improve compression and heating performance. By using the smaller OMEGA facility, researchers will be able to conduct experiments more rapidly, speeding the learning process and validating the MagLIF approach. Sandia’s team will also use their experimental results to validate and expand a suite of simulation and numerical design tools to improve future fusion energy applications that employ magnetized inertial fusion concepts. This project will help accelerate the development of the MagLIF concept, and assist with the continued development of intermediate density approaches across the ALPHA program. 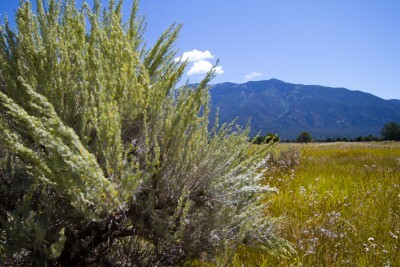 The Sandia National Laboratories team will develop a set of technologies to link below ground carbon partitioning with aboveground photosynthetic measurements. They will use microneedle sensor technology, originally developed for medical applications such as glucose level monitoring, to non-destructively measure the transport and composition of plant sap and products of photosynthesis in the field. In addition, they will measure the soil chemistry near the root zone with a micro-gas chromatograph, a device used to separate and analyze individual compounds. Using data analytics and modeling, they will link these measurements together to find aboveground proxies for below ground processes. If successful, the project will allow for the selection of improved sorghum varieties with increased root biomass without excavation of roots. View the full release or learn more about the Rhizosphere Observations Optimizing Terrestrial Sequestration ROOTS) projects here. Top Left: Schematic of ternary polymer monolayers. Top Right: AFM images of experimental systems, at different polymer fractions, compared with corresponding SCFT calculations. Bottom: phase diagram. By creating a dense layer with three types of polymer molecules bound to a surface, we have demonstrated unique self-assembled patterns both theoretically and experimentally. Programmable polymer domains can be used to template novel electronic or photonic material, for example to precisely place quantum dots for controlled energy transfer. Polymer domains on nanoparticles can control their assembly to create new responsive materials. 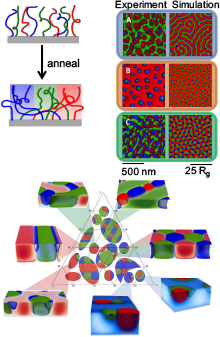 Self-consistent field theory (SCFT) was used to calculate the self-assembled patterns and phase diagram for ternary mixtures of surface-bound polymers. Ternary polymer monolayers were synthesized by polymerizing from a surface and shown to form laterally-phase separated domains in agreement with theory.